Cain Duck, son of Thomas and Priscilla, was baptised in Calne, Wiltshire, on 23 June 1776. Elizabeth Manners, daughter of Benjamin and Anne, was born on 31 May 1790 and baptised in Calne on 13 June 1790. Both families lived in Blackland, a hamlet to the south of Calne. 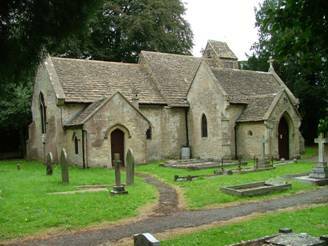 St Peter’s church in Blackland park, was probably a chapel of ease for Calne parish and it is very likely that all the baptisms and marriages took place at St Peter’s rather than in Calne itself. There are certainly a lot of the Duck and Manners family members buried in the small churchyard. as the parish registers appear with those for Calne. Baptisms have only been found for Enoch, Ann and Priscilla but links for the other children can be shown. Elijah was staying with Enoch and Ann in Stockley in 1841. Matthias’ marriage certificate in 1849 states that his father was Cain Duck, a baker. Nathan, Abraham and Isaac were shown with their parents in 1841 and as brothers living in Stockley in 1851. Furthermore, Nathan had his widowed mother staying with him in 1871. In 1837 Elizabeth’s father, Benjamin Manners, died and in his will he left her one of a pair of cottages in Blackland, which 18 months earlier had been in the occupation of William Dew. In 1841 Cain and Elizabeth were living in Blackland Tithing, Calne, with their 3 youngest children; Nathan, Abraham and Isaac. Cain, Nathan and Abraham were all shown as agricultural labourers. Enoch, Ann and Elijah were living in Stockley, Matthias was a carpenter staying with his uncle Abel, also a carpenter, in Corsham, and Priscilla was a servant in Compton Bassett. 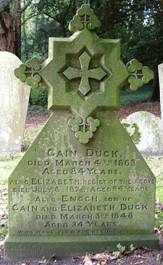 In 1842 Cain was bequeathed the sum of five pounds when his brother Abel Duck died. Elijah married in 1847, Matthias and Priscilla in 1849. In 1851 Cain and Elizabeth were at Calstone, and Cain was again shown as an agricultural labourer. Nathan was in Stockley with his brothers; Abraham and Isaac, all labourers. In 1861 Cain and Elizabeth were shown at New Buildings, Blackland and Cain died two years later aged about 87. Nathan and Abraham do not seem to have married but worked together as bakers in Stockley and in 1871 they had their widowed mother, Elizabeth living with them, along with Matthias’ daughter, Louisa. Elizabeth died in 1874, aged 84. Enoch was a witness to William Carpenter’s will of January 1847 but he appears to have died within a month or so of this as his death was registered in Calne in the same quarter. 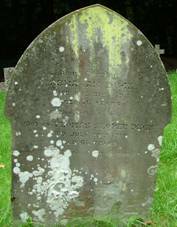 He is remembered on his parents’ gravestone but his date of death should read March 3rd 1847. He is not known to have married. Ann died in 1903 aged 88. In 1847 Elijah, farmer of Corsham formerly of Stockley, was named as a trustee and witness of the will of William Carpenter of Roughlease Farm, Calne. In 1851 and 1861 Elijah was farming 63 acres at Thingley farm. He then moved to Pitts farm which was recorded in 1871 as 90 acres and 1881 as 100 acres. By 1881 he was a widow, Elizabeth having died in 1879, and his unmarried son, Enoch, and daughter, Lucy, were living with him. By 1891 he was a retired farmer living at Church Farm, Corsham, still with Enoch and Lucy, and he died later that year, aged 75. Matthias married Ann Adams in Swindon in 1849. In 1851 they were in Stockley, but at some point they moved to Purton. In 1861 they were farming at Bentham, in 1871 at Alma Farm, Bentham, and in 1881 at Stoke, all in Purton. By 1891 they had retired and were living in Stockley and in 1901 they were staying with Priscilla’s brother, Nathan. Nathan and Abraham did not marry but spent their lives in Stockley working as bakers and mealmen. Abraham died in 1898, aged 70, and by 1901 their sister Priscilla and her retired farmer husband James Carpenter had moved in with Nathan. Nathan died in1907, aged 82. In 1861 Isaac was recorded as Innkeeper and farmer of 70 acres living at the Bell Inn public house in Cherhill. He appears to have farmed there all his life and died in 1908, aged 77.